Women in SF&F Month 2018 Begins Tomorrow! Since 2012, the month of April at Fantasy Cafe has been dedicated to highlighting the wonderful work women have been doing in speculative fiction. When closing last year’s series, I mentioned that it may be the last series of April guest posts—but I’m happy to say that 2017 will not be the last one and the seventh annual Women in SF&F event begins tomorrow! However, it will be slightly different since I did make the possible adjustment also mentioned in that post from the end of 2017: keeping it a little smaller than it has been during the past six years. This year, it will be taking place on weekdays during the second and third weeks of the month plus part of the fourth week instead of extending across all four full weeks of April. For the last few years, I’ve set aside reviews and other book coverage during the month of April and instead held a month-long series of guest posts highlighting some of the women doing amazing work in speculative fiction. Throughout the month, guests will discuss a variety of topics—many of which will be related to women in science fiction and fantasy but not necessarily all since the goal is simply to gather a group of women invested in the genre in one place for a month and showcase the wonderful work they are doing. Past contributions have ranged from women discussing their own work and process to what they find best about the works of other women to issues of representation and equity in fandom. Before the first Women in SF&F Month, I had been making an effort to read and review a lot of speculative fiction books by women on this blog—but it wasn’t always that way. After I started reading fantasy and seeking more book recommendations online, I found that very few of the books I heard about the most were written by women. I didn’t actually notice this for quite awhile since I just read the books that were supposed to be good without giving much thought to who wrote them beyond whether or not I considered them an author worth reading. 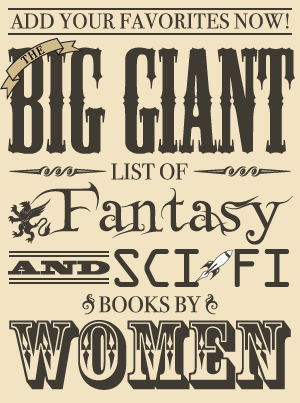 It wasn’t until I saw an online discussion about women writing science fiction and fantasy that I realized I found it a lot easier to name men writing books in these genres than women. After that, I started paying more attention to women’s names when they were mentioned (which was usually here and there instead of everywhere like a lot of well-known fantasy and science fiction authors). I discovered there were all kinds of women writing speculative fiction that I’d missed out on since I read a lot of the (mostly male) authors praised all over the Internet. While many of these recommended authors do write books I enjoy, there are also many women who deserve to be read and lauded just as often. Once I realized women’s books did not seem to be discussed as much, I turned to reading and reviewing more books by women to try to make my small corner of the Internet a place where some of these books were featured. Then, in 2012, there were a couple of discussions on the Internet about both review coverage of books by women and the lack of blogs by women suggested for Hugo Awards in the fan categories. After these discussions and some of the responses to them (one of which was that women weren’t being reviewed or mentioned because they weren’t writing and reviewing science fiction and fantasy), I wanted to show that there were lots of women writing, reviewing, and discussing speculative fiction whose work should be recognized. I decided to see if I could pull together enough guest posts to spend about a month highlighting women in science fiction and fantasy. At the time this decision was made, it seemed most reasonable to aim for an April event—and that’s how April became Women in SF&F Month on Fantasy Cafe!